Tvorog is a very popular and nutritious dairy product that is very similar to western cottage cheese, though most Russians will swear by tvorog. 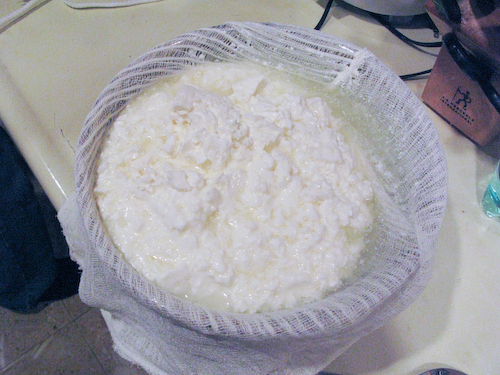 Similarly to cottage cheese, this is an extremely easy cheese to make at home, and a lot cheaper. It is commonly used in a variety of baked goods as well as eaten plain or with and berries. If you find yourself some raw milk, you won’t need any additional ingredients. Pasteurization tends to kill all the useful bacteria in milk. 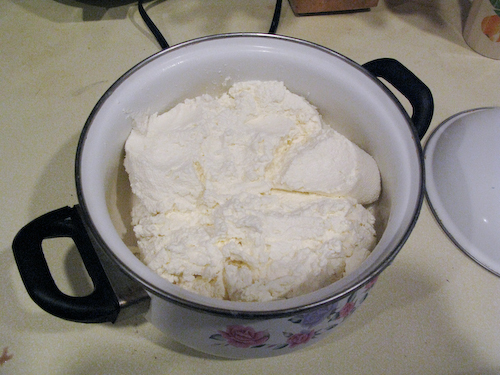 To mix the milk and the sour cream together, add the milk to the sour cream. Add a small amount at a time while mixing to form a uniform mixture. 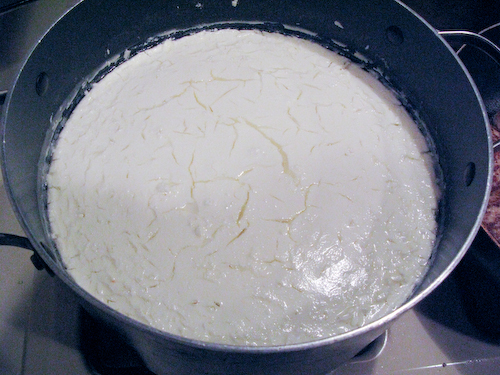 Once the mixture is relatively thin, add the remainder of the milk. 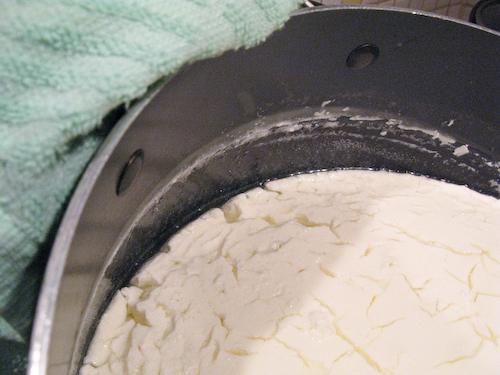 You do this to avoid forming clumps of sour cream in the mix. You need to set aside the mix in a warm place. Near the stove/oven is usually a good place. Let it stand for about 2-3 days until the mix starts to curdle. It will develop a jello like mass that can easily separate from the walls of the pot. Once it has the desired consistency, place the pot in a 250 F oven for about an hour. Remove from the oven and let it cool overnight. Now you’ll have to separate the curd from the whey. For this, you will need a cheese cloth or a large square of gauze. 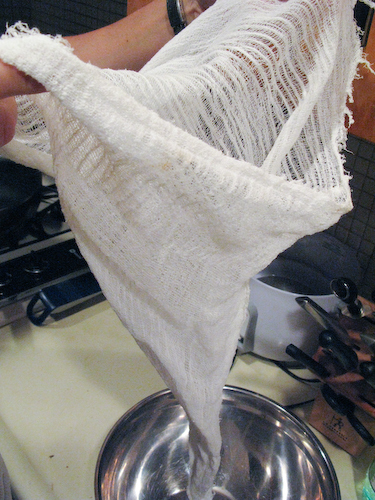 Similarly to draining pasta, place the cheese cloth over another pot and pour the whey and curd into it through the cheese cloth. 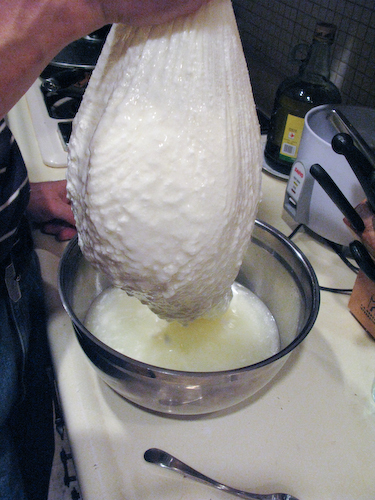 Carefully lift the cheese cloth by its edges making sure to not spill any curd. 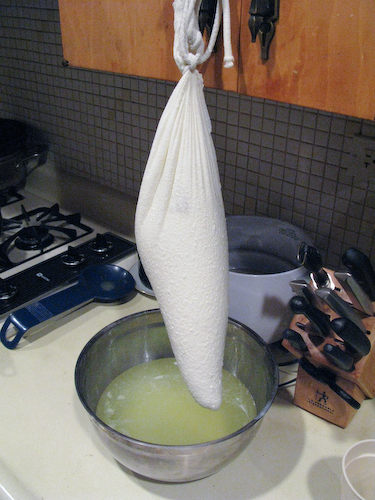 Tie the cheese cloth and hang it over the whey. Let it drain for the day or overnight, and you have yourself some tvorog. If you want to get it down to the moisture content of farmer’s cheese, press the cheese cloth between two cutting boards and let it sit for another day. The tvorog will keep in the fridge for about a week. I am wondering how this could be safe to consume. You let milk sit out overnight? I don’t get it. It’s perfectly safe. 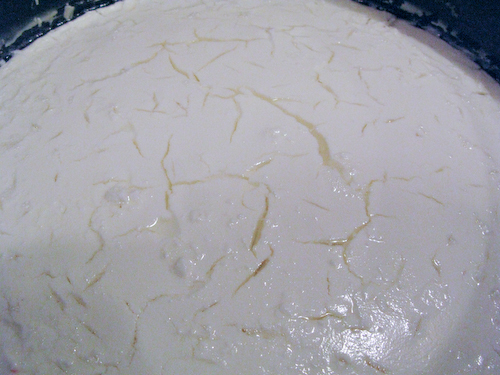 You’re letting the milk ferment using the bacteria cultures naturally found in raw milk (in this case reintroduced by adding the sour cream). Fermented milk is different from spoiled milk, and it is used in quite a few common dairy products such as most cheeses, yogurt, buttermilk, cream cheese, etc. Check out this wikipedia article for more info. If I were to make farmers cheese can it be dipped into wax to make it last longer or is the cheese going to be to soft for that? Tvorog is for sure too moist for waxing. 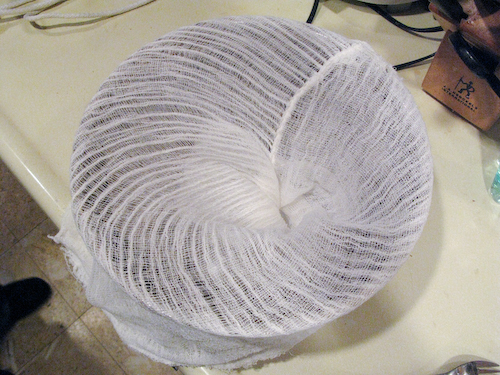 However, even if you dehydrate it to the consistency of farmer’s cheese, it may still be too moist. As far as I know, only certain kinds of hard cheeses can be waxed. YOu can make the best cakes and pancakes from this cheese. This is the best source of calcium!!!! Lovely idea there! Great for cakes and pancakes.